This is era of the emerging BPO provider, as IT services stagnate and clients demand greater personalization and attention from business services firms that have the scale, resources, hunger and technology enablement skills to take on increasing complexity and make sense out of the dataswamps plaguing so many of today's businesses. One such stalwart of BPO, quietly going about its business over the years with steady growth and increasing reputation for solid delivery, is WNS (yes, the one that was spawned out of the British Airways captive back in the day). WNS has performed well over the years, growing business streams in knowledge process domains, finance and accounting, insurance, travel, mid-size banks, contact center and some other areas. It has oft-threatened to make a grander procurement BPO play, but mostly opted to partner with the likes of Denali when the need arised. To start the New Year with a bang, WNS announced the $40 million acquisition of Denali Sourcing Services. 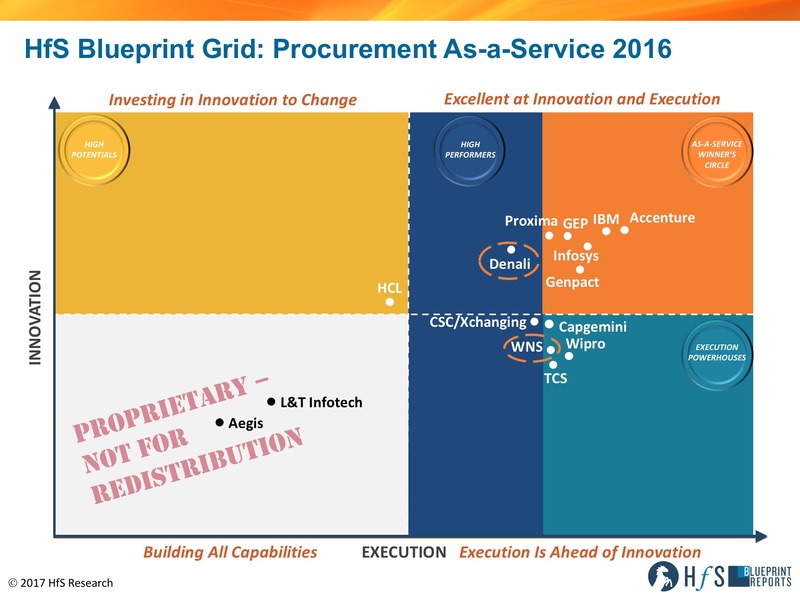 We have covered both WNS and Denali in our December 2016 Procurement As-a-Service Blueprint. WNS is ranked as an Execution Powerhouse, while Denali is a High Performer in the Procurement As-a-Service market. The acquisition of Denali Sourcing Services is a good move from WNS, and effectively bolsters both organizations’ capabilities. Building on a partnership that has developed over the last couple of years, in which WNS and Denali together offered end-to-end procurement solutions, these two organizations know each other well and have extensively explored their complementary capabilities. Integrating and move forward as one is a logical next step. Denali is an agile and dynamic strategic sourcing and category management pure play provider of procurement managed services, known for strong relationships with clients and quality of their personalized account management and service delivery. WNS’ strengths lie in procure to pay (P2P), transactional and tactical procurement services, often part of a multi-tower BPO engagement stemming from its F&A process heritage. Delivering large end-to-end Procurement-as-a-Service was a partnership effort for WNS end Denali, with Denali providing the upstream Source-to-Contract (S2C) scope and WNS providing the large scale downstream Procure-to-Pay (P2P) scope or as part of multi-tower engagements. WNS procurement clients have commented positively on the level of access and commitment shown by WNS senior management. The expertise and empowerment of their project management teams and their hands-on management style fits well with Denali’s personal account management style. Denali was one of the pioneers of on-demand, managed services in the procurement market. It has build out on-demand As-a-Service offerings and commercial models over the last several years. Its plug and play “Category strategy on demand” platform is a fitting example. WNS is known for being flexible in delivery and commercial models, going the extra mile to meet client needs, earning a reputation of being easy to work with. Besides the common ground Denali and WNS share, there are a number of challenges either organization had in the Procurement As-a-Service market which are addressed by this acquisition. WNS lacked in innovation in Procurement As-a-Service. Clients express a desire for innovative ideas and proposals from WNS. Briefings HfS had with WNS show us their willingness and ambitions to become a more innovative partner for clients. Denali has been an innovator in the space for years and adds a valuable piece to WNS in terms of innovation. WNS needed to move up the strategic value chain. In order to position itself as a more strategic partner to clients, we encouraged WNS to focus on immersing at more strategic levels in the client organization. A more pronounced vision and thought leadership for change in procurement is a vehicle to engage more senior leadership at client organizations and the addition of Denali’s strategic procurement acumen and thought leadership fills this gap. Vision for the future of procurement. In our Blueprint, we challenged WNS to develop and articulate their vision for Procurement As-a-Service; “WNS procurement deals are generally just a component of multi-process BPO engagements. HfS would like to see a greater vision from WNS as to how they will transition in the future to offering more modular procurement solutions which is where we believe the PO market is heading over the next several years”. Denali has a strong vision and strategy for Procurement As-a-Service, for instance around Category Enablement, offering on-demand academy, templates and coaching to category strategies and category plans, adding capability that sustains the client organization. This vision resonates with more mature procurement organizations and younger hi-tech organizations looking for different ways to organize procurement. North America: Denali gives WNS a much needed foothold in North America, where most of Denali’s revenue comes from (~95%). Denali needed to expand its geographic footprint further to continue to compete with the larger global delivery capabilities of competitors. End-to-end services. Although Denali served about a fifth of its clients with end-to-end procurement services, the focus and strength has always been upstream, strategic procurement. WNS’s strength in downstream, transactional procurement needed to be complemented by upstream capabilities to compete for more valuable and interesting deals in a market looking for help in strategic sourcing, category management, analytics while automating big chunks of transactional procurement processes. The successful partnership between both parties addressed this need to a certain extent, but with buyers consolidating in procurement, having ‘one throat to choke’ can be a plus in the current market. WNS and Denali have a great fit and several high value complementarities that will strengthen their capabilities. There are however a number of challenges that this acquisition doesn’t solve. WNS needs to keep its focus on these areas to become an even bigger challenger in the Procurement As-a-Service market. Procurement Technology. Although Denali brings a number of proprietary technologies into WNS, it still lacks the core procurement technology platform many of the As-a-Service Winner’s Circle providers have. Expanding partnerships with procurement technology platform providers like Ariba, Coupa, Tradeshift is part of solution to this challenge. Invest in methodical process improvement. Clients love Denali’s flexibility and willingness to engage in a consultative manner, but would be willing to trade some of that for a more process improvement oriented and best practice sharing culture in delivery. WNS can also do more to provide proactive and methodical process improvement into engagements according to clients we interviewed for the Procurement As-a-Service Blueprint. Knowledge sharing and client communities. Clients love to be more involved in client communities, learning from experiences and developments in other client organizations. We mentioned this can contribute to Denali’s role of innovation partner, even more in the new constellation. This acquisition is not going to shift the market dramatically nor is it putting leading providers on notice. The direction of the market is clear and the move to smaller, shorter, on-demand, modular, As-a-Service delivery and commercial models focused on value adding strategic procurement will continue. The talent shortage in upstream procurement is growing and WNS has managed to secure one of the sources of sought after strategic sourcing and category talent in Denali. The WNS/Denali combination is a stronger competitor for end-to-end procurement, providing the market with a stronger alternative for clients looking for a flexible, collaborative approach. Analysts and market experts expected a lot of M&A activity following Accenture’s acquisition of Procurian in 2014. Denali was one of the pure play procurement specialists on the M&A radar. In the years following the Procurian acquisition, not a lot of movement materialized. This acquisition by WNS not only expands on an already successful partnership, a fact that can help the post-acquisition integration efforts and increase time to value for this acquisition, it also makes a lot of sense from the market direction and capabilities that are needed for Procurement As-a-Service. It brings together two organizations that showed a willingness to invest in flexibility, meeting the varying needs of clients with delivery models, pricing options and commercial constructs. 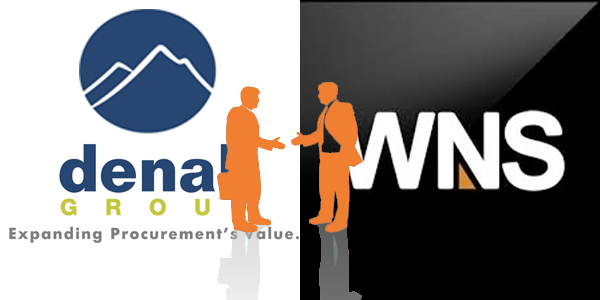 One of the keys to success is the positioning of the new WNS/Denali procurement practice in the market. 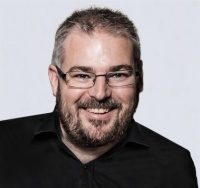 Derk Erbé is Research Vice President, Supply Chain, Procurement and Energy at HfS Research (full bio here). Derk is responsible for a compelling, leading-edge research agenda covering the core topics of interest for buyer and vendor communities in the areas of digital business transformation services and business operations, with a specific emphasis on key vertical markets, namely Energy, Utilities and Resource Industries.